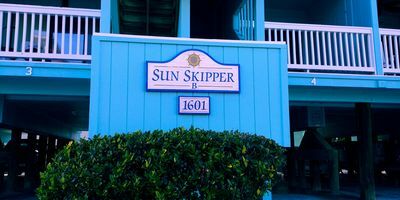 Sunseeker Inn – Suite 1 is a first floor suite with ocean views managed by Dale and Salt Water Real Estate and is a stellar location to relax and unwind ALL year round! 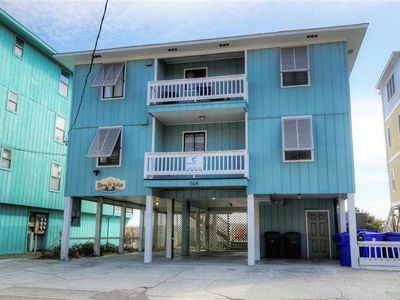 This unit sits just two rows back from fun in the sun at the beach and right Down Town! We provide as much value as we can to our guests while keeping our rates lower than most other hosts and hotels to ensure a memorable and amazing (and affordable!) trip. We reward our guests who leave us great reviews with gifts or discounted return stays at any number of our amazing properties because to us, a return guest is always worth celebrating. 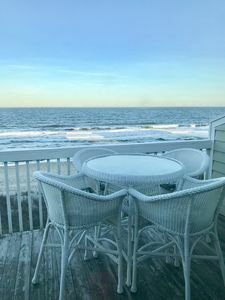 You can also stay in Kure Beach and fish directly off their fishing pier, have one of the best pork chops on earth at Freddie’s, or enjoy their own Farmer’s Markets, Concerts, and other events. 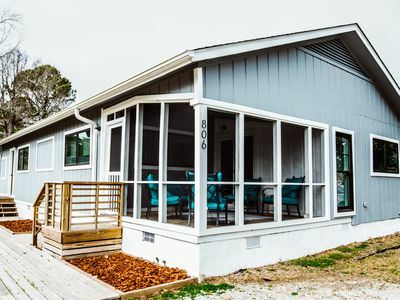 The Aquarium at Fort Fisher, numerous historic sites, a public boat launch, and the ferry over to Southport are right down the road! 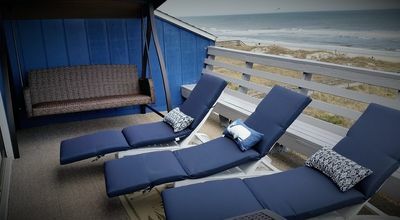 We welcome you to sit back, relax and enjoy yourselves because that's exactly what the beach is for! 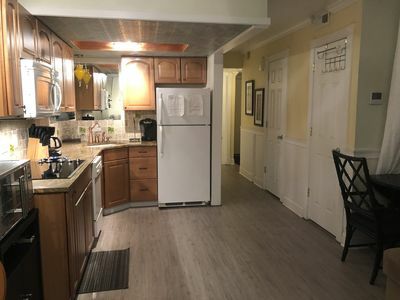 These suites are a mixture of the original “period” construction and old world charm, with a kiss of shabby-chic modernity and todays technology because hey, there’s got to be something for everyone! 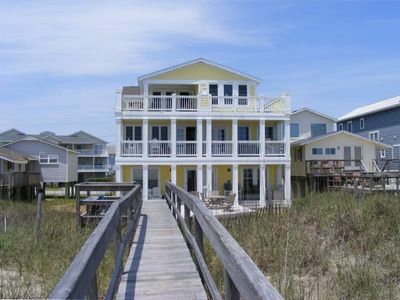 Each suite has its own distinct traits, quirks, and characteristics. 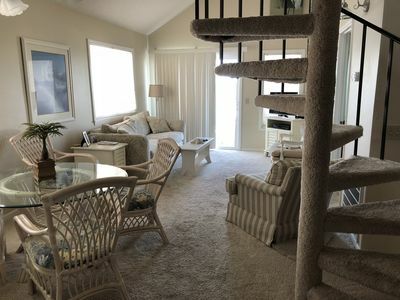 The entry to this 1 bedroom, 1 bath suite opens up into a large, newly furnished family room combined with an open dining area and fully equipped kitchen (stove+oven, refrigerator). The kitchen is stocked will all of the basic cooking and dining utensils one can expect (plates, bowls, cups, silverware, etc.). 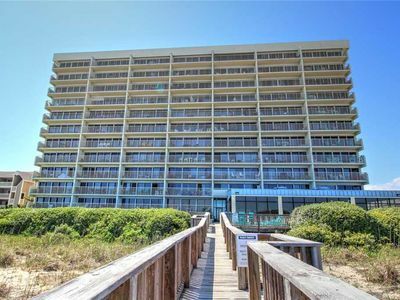 In addition, there is a microwave, toaster, coffer maker and blender ready to help make yourself at home (and on Vacay!). Courtesy organic soap, shampoo, and lotion are left in the bathroom of each suite as well as a starter roll of TP, a garbage bag, dish soap, a broom, and sponge in each kitchen. Most bedroom beds (including bunks) consist of either a plush luxury mattress or a new encased 8” memory foam/cooling gel composition mattress because we want all of our guests to be comfortable when it comes time to recharge. The pullout couches that can fit/support a memory foam pad are also accommodated with such! (Always bear in mind, although comfortable, a pullout couch/futon for a longer-term tenant may/may not provide ideal support!) Remember, linens are NOT provided in order to keep our rates low. 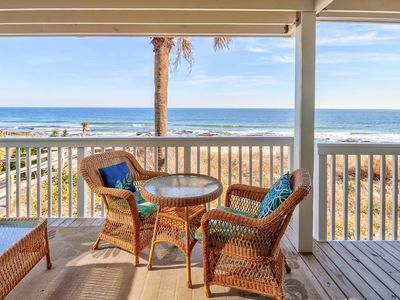 You can bring them from home with you, buy them (Wal-Mart in Wilmington), or rent them (Seaside Linens & Rentals). There is a pair of TV’s in each suite (with approx. 25 channels through Charter Spectrum cable) along with a WIFI computer connection for when it's time to sit back and enjoy some movies or shows after a long day at the beach! We equip each suite with its own books, games, and misc. accessories to help cover the basis for our guests to enjoy themselves in rain or shine. Sometimes however, these items are removed from the suite and not replaced and we do not realize it (tsk tsk!). If you notice something we’ve bragged about missing please let us know!!! The outdoor shower is off to the left side of the building to help keep the stand outside on the beach! 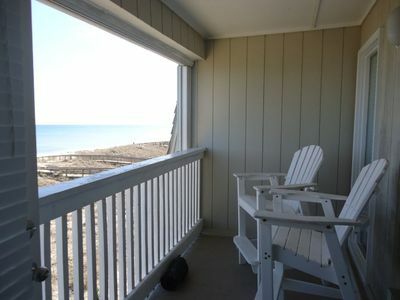 Guests have full access to their own private suite (never shared) along with a respective deck, patio, balcony, or yard. Each suite can vary slightly in archetype but what’s private to each guest or is a common area for all to share is easily recognizable. Feel free to reach out for any specific needs or clarifiers! Each guest will also have access to one or two assigned parking spaces. For additional spaces, please refer to our list of parking suggestions. -ALL suites are non-smoking (including vaping) and a heavy cleaning/repair charge can result if not adhered to. -Linens (sheets/towels) are not part of the suite rental. Please refer to the bedding chart in the profile for respective bed sizes and plan accordingly. We partner with “Seaside Linens & Rentals” for any guests looking to rent a linen package (sheet sets, towels, etc.) as opposed to bringing or buying your own. Although the hyper link will be blocked by this site, a simple web search can yield their contact information. They will deliver directly into the suite in advance of your stay! -Quiet(er) hours begin at 9:00pm EST. We host many families of all ages so we ask all our guests to be considerate, and enjoy the heck out of yourselves! -NO BBQ’ing on ANY decks or porches. This is a huge fire hazard and is fineable (along with removing smoke/Co2 alarms). We work extremely hard to keep all of our guests safe, and sometimes that takes teamwork! -Parking: Please refer to your welcome email for specifics with regards to parking. We have a set one or two designated spaces dependent upon location that come with each rental. OVERSIZED trucks and vehicles will always have tight fits on the island wherever they go (just an FYI!). For additional spaces, please refer to our local parking lot list. -Local Additional Parking: The municipal down town free parking lot is less then one block away for those driving additional vehicles or requiring oversized parking. 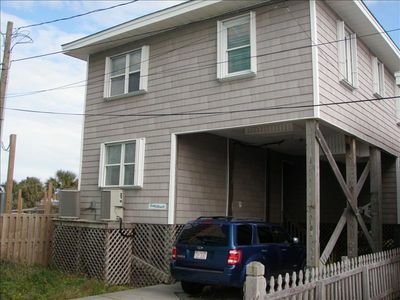 There are also additional street spaces atop the property’s lot that are available on a first come first serve basis. -April 1st through September 30th, dogs are allowed on the beach during restricted hours BEFORE 9:00 a.m. and AFTER 5:00 p.m. Dogs are not allowed on the beach between 9AM-5PM. -Please always consider TRAVEL INSURANCE from your respective booking site or vendor to help protect your $ in case of inclement weather or last minute travel complications (court, illness, etc.). These items are NOT refundable scenarios, regardless of scale unless the property itself is compromised. If that does happen, we will do our absolute best to find you alternative housing. When advanced enough notice is provided with regards to a cancellation request, we try and refill the suite to help a renter in need break their rental agreement. If we can, we help break said lease regardless of cancellation policy for a full refund. LIFE HAPPENS to us all. But a tough day at the beach is better than a tough day most everywhere else! 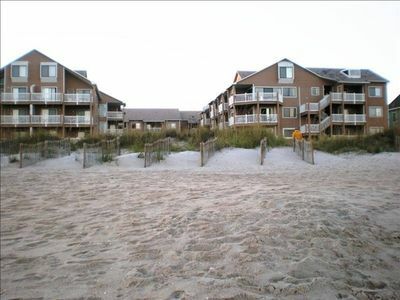 -Carolina Beach Town Hall supplies, where available, beach wheel chairs that can traverse the sand without charge. Please reach out to the Recreation Center for additional information. 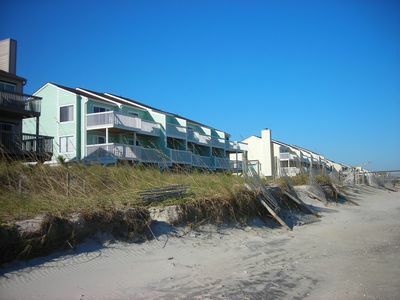 The building itself is a short walk from the nearest beach access. 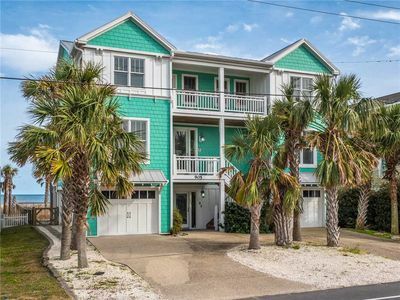 The property is on the fringe of down town Kure Beach with its shops, activities and dining and is just down the road from Carolina Beach! 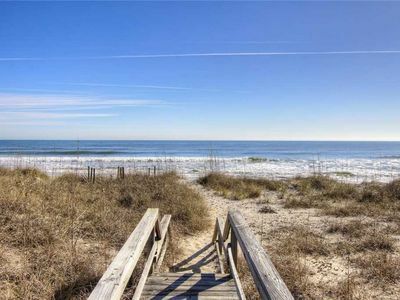 In Carolina Beach, there are fireworks during the summer every Thursday night, Movies at the lake each Sunday night, and local fairs around the lake each Saturday morning (refer to for additional info!). 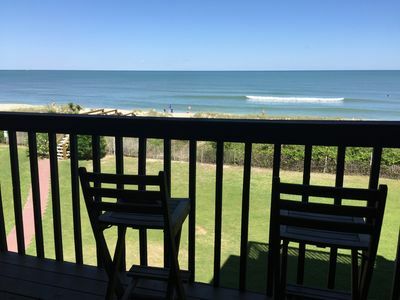 Kure Beach is a mix of friendly locals, snowbirds, and vacationers all looking to escape the inland and enjoy the sand, surf, and atmosphere. We truly have an amazing community! 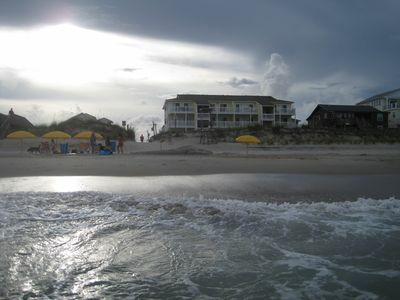 Kure Beach and the surrounding neighborhood offers an array of sights and activities to enjoy while here. Some of these examples are (but not limited to) a subtle beach hike up the road through Carolina Beach State Park, Finishing on the Kure Beach Pier, Kayaking to one of the many islands surrounding the Intracoastal Waterway, watching canons blast during a historical reenactment at the Fort Fisher State Historic Site, or petting some Sting Rays at the North Carolina Aquarium at Fort Fisher. This doesn’t even include the aweing scenery of Airlie Gardens, and our very own battleship (USS NC) in Wilmington! Perhaps more relaxing and less “adventure” is your speed. Our own local Brewery (Good Hops) along with a round of Frisbee golf may be a great time. And between the beach and Down Town Wilmington, boy do we have FOOD, Festivals, and good times! 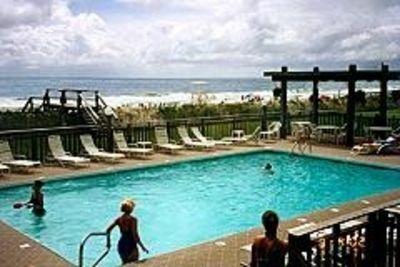 Food, dining, and a multitude of outdoor activities are all well within walking distance. Downtown Carolina Beach has a number of vendors (such as Pleasure Island Rentals @ 2 N Lake Park Blvd Carolina Beach NC 28428 and Tony Silvagni Surf School @ 101 Cape Fear Blvd Carolina Beach NC 28428) that offer golf carts, paddleboards, surfboards, kayaks, and bicycles for rent as an alternative to driving. Taxi’s and Uber’s are always available for an assist when needed as well throughout the island! 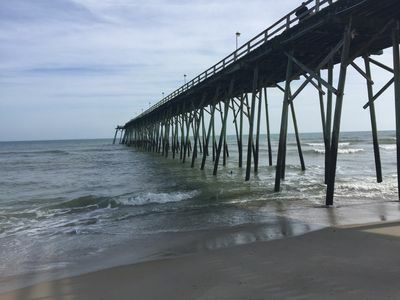 You can catch a Ferry to Southport in Kure Beach @ 2422 Fort Fisher Blvd S Kure Beach which leads to another ferry to Bald Head Island where NO CARS are allowed! WE NEVER CHARGE A CANCELLATION FEE!! 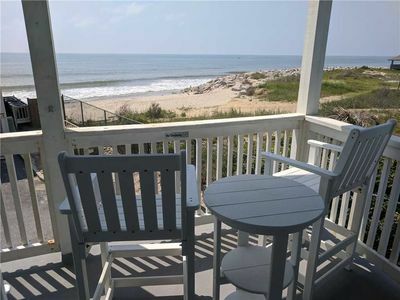 -- CHAIRS LINENS BEACH CART BIKES ALL INC.